There are many artists who have personal visions. Some I am fascinated by, and by some I am left wondering. 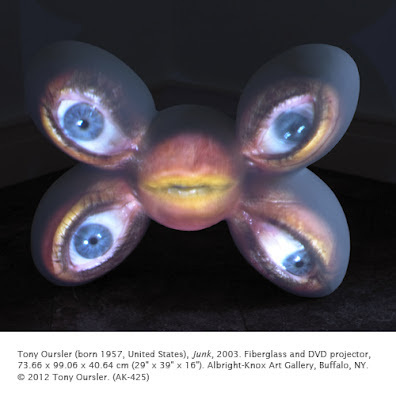 I’m not quite sure where I stand with Tony Oursler. I went to an installation of his work once (I think it was at the Metropolitan Museum of Art, but I’m not sure), and, being a painter, wondered what his work was about. Now I look at his installations as a 21st century extensions of Dada and Surrealism, since he is exploring psychological disintegration through the juxtaposition of various elements, often body parts. The exploration of psychological impact in art is not a new idea, but Oursler does it in an extremely unique way that makes his work really extraordinary. I’ve come to see his work as a brilliant expression of 21st century complexity in the art world. Unlike earlier decades in contemporary art—with focus on gender, sexuality, race, and angst— the 1990s had no single direction in art. Throughout the nineties the importance of feminism, race, and sexual orientation diminished in favor of broader social themes such as war, politics, and social stratification. However, the human body continued to be an important subject in art. The interest in the body is no coincidence in a decade that was obsessed by AIDS. Another difficulty in categorizing art of the 1990s is that many artist chose to work in non-traditional media, focusing on video installations that challenged (as performance art did in the 1960s) the iconic nature of painting. Oursler was born in New York and lives and works there now. He studied at the California Institute of Arts (“CalArts”) when John Baldessari, Judy Pfaff, and Laurie Anderson taught there, all of whom had crucial impact on his art. Also influencing his art was the cable television station MTV, contributing considerably to video and electronic art during the 1980s. 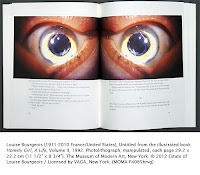 Viewers of Oursler’s art do not stare at a screen, but rather everyday objects enlivened by his projections. The juxtaposition of moving body parts on an immovable object naturally calls to mind the subliminal aspect of Dada and Surrealism, where the viewer was invited to form their own interpretation. His works evoke more of a frame of mind rather than a narrative. Junk is a biomorphic form with a projection of blinking eyes and a constantly talking mouth. It is a comment by Oursler on contemporary society’s sense of neediness and self-absorption. Although video cameras became available in 1965, the image had to be view on a television monitor. The digital era revolutionized the ability for artists to project on any surface. I find interesting comparisons between his work and that of Louise Bourgeois in her illustration for Arthur Miller’s book “Homely Girl, a Life.” The book chronicles the travails of a girl whose mother constantly regales her with what “true beauty” is. Bourgeois’ illustrations emphasize not only the ultimate triumph of someone considered homely (in some people’s eyes), but allude to the fact that the heroine of the book eventually falls for a blind musician. 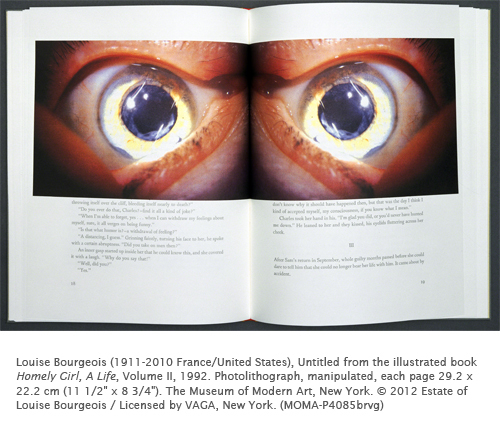 As opposed to Oursler’s work, Bourgeois’ work is narrative.